Before getting started on all of those holiday cards, I needed to make a card for my youngest granddaughter, Audries, birthday 5th party at Let's Jump, a jumping and other activity spot for the younger set (not the Grandma set). The card I made was using the tutorial from Alesha Wells http://www.splitcoaststampers.com/resources/tutorials/scallopedgemedallion that was on Splitcoast this past week. 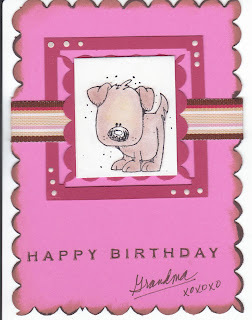 The little puppy image is from Whipper Snapper Designs "Little Puppy". I only used the card front in Pixie Pink and the medallian in Purely Pomegranite. The little puppy (white cs) unfolds up to reveal "Love You" from SU's Tiny Talk set. The Happy Birthday is SU's It's Your Birthday set. I used the Scallop Edge Punch for the medallian (following the tutorial) and all along the edge of the card front and shaded it with ColorBox Cats Eye shaders. The ribbon is from my stahs and has all of the colors used on the card materials. I hope Audrie likes her little puppy. I thought it turned out really cute! This card is precious and I love what Lillian said - "That must be from Grandma!" They will always remember what awesome cards you made for them. That is a gift!